She attended the AAHomecare 2007 Washington Legislative Conference as Ms. Wheelchair Massachusetts, sponsored by the New England Medical Equipment Dealers Association (NEMED). 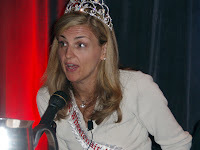 However, through NEMED’s support and encouragement Ms. McCosh returned to the 2008 conference as the reigning Ms. Wheelchair America 2008. “Ms. Wheelchair America is not a beauty contest,” McCosh said. According to the pageant’s website, it is instead a competition to select the most accomplished and articulate spokesperson for the millions of Americans with disabilities. Many state homecare associations are working to bring the Ms. Wheelchair America contest to new states. Visit her blog at: www.mswheelchairamerica08.blogspot.com. McCosh can be reached at mswheelchairamerican08@yahoo.com.